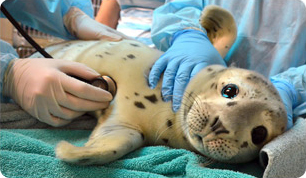 Weighing only 17 pounds, Pacific harbor seal Garnett was scooped out of the water in Suisun Bay in Contra Costa County by a well-meaning boater. Only days old, the white pup appeared quite healthy and should never have never been removed from his natural habitat! The sad news is that pups like Garnett are frequently picked up by beachgoers who mistake them for orphans, when, in reality, their mothers are busy foraging for food. Upon admission, volunteers begin tube-feeding pups a special multi-milk formula made from soymilk, vitamins and salmon oil to help them grow strong and healthy. Later, pups attend "fish school" where volunteers teach them how to identify, catch and eat live fish – a prerequisite for release back into the wild. After a few months of loving care, Garnett "graduated" and was release at Point Reyes National Seashore.